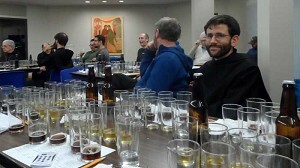 Brother Teresio Caldwell samples ales to find the best recipes to be served at the brewery. Chris Jones and Father Martin Grassel stand in front of the Fort, future site of the Benedictine Brewery. A new, sustainable revenue source is brewing at Mount Angel Abbey. 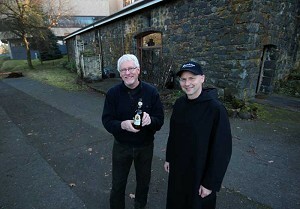 In 2014, the Benedictine monks will restore a 1,500-year-old monastic tradition of brewing beer. Made from locally sourced hops and water from the abbey well, the Benedictine Brewery beer will be available for purchase at the Mount Angel brewery and tasting room by the summer. “Taste and believe” is the brewery’s slogan. The handcrafted beer will be a friendly way to welcome new people to witness the Benedictine way of life, Father Pius said. “Benedictine hospitality is not just about getting together with the people you know and love, but encountering Christ in everyone you meet,” he said. Starting in eighth century Europe, when local water supplies were rife with disease, monks brewed beer as a way to sanitize the water and also produce a libation to serve guests who sought refuge in their monasteries. Beer was an important part of their diets, particularly because it could be consumed as a source of nourishment during Lenten fasts. After the recession caused revenues from the abbey’s sustainable tree farm to dwindle, Mount Angel's monks began investigating other revenue sources to support their Benedictine tradition, which emphasizes prayer and sustainable life. In the 1930s, the abbey owned more than 1,500 acres of farmland where Oregon hops had been grown for more than 50 years. Today, hops are still grown on abbey land. In 2012, Chris Jones, Mount Angel Abbey’s enterprises manager, began collaborating with Father Martin Grassel, abbey curator, to identify new revenue sources. At the time, Father Martin was also experimenting with home brewing, after receiving a set of used brewing equipment. The two men generated a long list of potential revenue sources to present during a community meeting of 40 monks. Brewing, inspired by Father Martin’s new hobby, was last on the list. “That was the one thing I was sure would not fly,” Father Martin said. As the meeting progressed, the community voted down their proposals, one by one. Father Martin, discouraged, presented his final suggestion — the brewery. To his surprise, the concept received enthusiastic support. Since then, Father Martin and Jones have interviewed experts in the regional craft brewing industry, created and launched a solid business plan, and are now in the process of working with fermentations scientists at Oregon State University to develop recipes. The men were delighted to discover a strong camaraderie among those who work in the craft brewing industry; contacts were generous with their knowledge and expertise. Monks from the abbey have provided input throughout the process. They participated in numerous tasting sessions to choose the most delicious prototypes. The Benedictine Brewery’s Facebook page has photos of habit-clad monks sipping pale ales and darker drafts. An underused building, nicknamed “The Fort,” will be converted to house the brewery. Built in 1903 with the stone remnants of the first monastery that burned down in 1892, the Fort was once used to store wine and grapes grown on an abbey vineyard. Right now, the brewing equipment is being manufactured by an Oregon company, and Jones and Father Martin are working to secure proper permitting to begin building renovations. Father Martin acknowledges the moral dilemma of selling a product that can be consumed without harm, but is also linked to societal ills. He uses St. Thomas Aquinas’ principle of double effect as ethical criteria to find an answer: Does the potential good outweigh the potential negatives? Profits from the sales will allow the monks to continue their works of Christian charity, he said, serving as a sign of Christ in the world. Their goal isn’t to flood the world with alcohol, but to instead become self-sustaining. That is why the beer will only be available at the monastery tasting room. The Benedictines hope people will be inspired by the beautiful spirituality of the Hilltop. Some people will get their beer and go home, but some will explore the grounds. Some may even step inside the Abbey church. The monks at Mount Angel will not be the only Benedictines brewing beer in the United States. They join the Monastery of Christ in the Desert in New Mexico, as well as several other monastery breweries in Europe.